In a new legal brief, the New York Civil Liberties Union, the American Civil Liberties Union, the Brennan Center for Justice and the Electronic Frontier Foundation argue that the government cannot pry into historical databases of people's cell phone location information without a warrant. The brief concerns a case in which prosecutors compelled a cell phone provider to turn over more than half a year of a Long Island man's cell phone location records without a warrant. "Cell phone location information can provide a detailed and intimate portrait of someone's private life - attendance at churches or mosques, intimate relationships, participation in a protest or visits to a psychiatrist," said NYCLU Staff Attorney Mariko Hirose. "Law enforcement can't make cell phone companies turn over New Yorkers' intimate records without a warrant." In the case, People of the State of New York v. Ali Moalawi and Ricky Moore, in the course of investigating alleged burglaries on six discrete days, the prosecution went to the cell phone provider without a warrant and compelled the company to turn over more than six months of Moalawi's cell phone location history. This history revealed 10,438 data points - a location point approximately every half hour - about Moalawi's past locations, painting a highly detailed profile of his life including the nights that he spent at his home in Huntington Station, the nights that he spent at his fiancée's home in Sea Gate, the days that he most likely did not work and a pattern of late-evening outings in Prospect Heights. "This case is about more than just this one story," Hirose said. "Ninety percent of Americans have a cell phone. Law enforcement shouldn't be able to learn about all of our most intimate comings and goings without following very basic privacy protections." In its friend of the court brief, the NYCLU urges the court to suppress the cell phone location history in this case and argues that under the New York State Constitution, law enforcement must obtain a warrant before tapping into the historical database of people's cell phone location information. The New York Court of Appeals held in People v. Weaver, in which the NYCLU also filed a brief, that law enforcement must obtain a warrant before capturing two months of GPS surveillance. Cellular service providers in turn now have the technology to record the geographic location of almost every American at almost every time of day and night. Nearly three-quarters of smart phone users report being within five feet of their phones most of the time, with 12 percent admitting that they even use their phones in the shower. In People of the State of New York v. Ali Moalawi and Ricky Moore, the prosecution obtained more than six months of cell phone location data about Ali Moalawi without a warrant. The NYCLU conducted a cursory review of just one week's worth of that data - the week of March 1, 2014. Our review shows that cell phone location data reveals highly intimate details about Moalawi's life. The NYCLU reviewed Moalawi's location history from one week and without any sophisticated analytical tools. One can imagine how much more intrusive a review of six months of records would be, especially if using sophisticated analytical tools and/or merging the data with other records such as automatic license plate reader information, surveillance camera footage and internet records. Below are sample maps based on Moalawi's cell phone location history and inferences that can be drawn from the data about his private comings and goings. 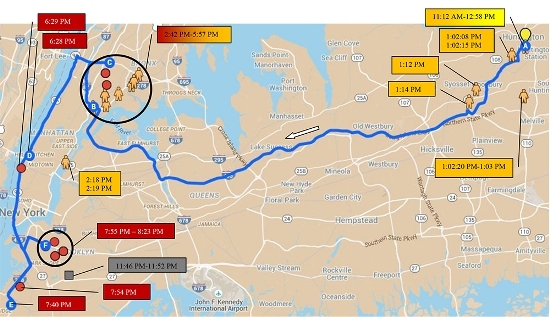 Map 1 -- Monday, March 3: Afternoon at Stony Brook University, and sleep over at fiancée's house. 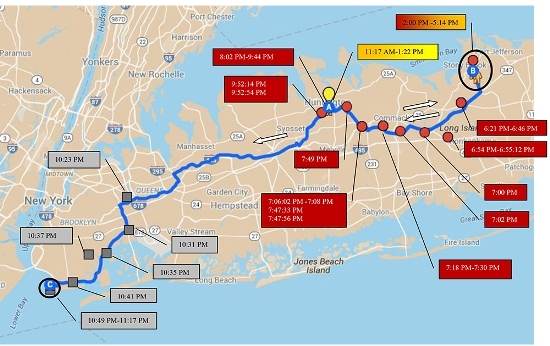 Moalawi was at or near his home until about 1:22 p.m., and drove to Stony Brook University, arriving at around 2 p.m. He stayed in Stony Brook for a few hours, most likely at the university, and then spent some time between Smithtown and Centereach. 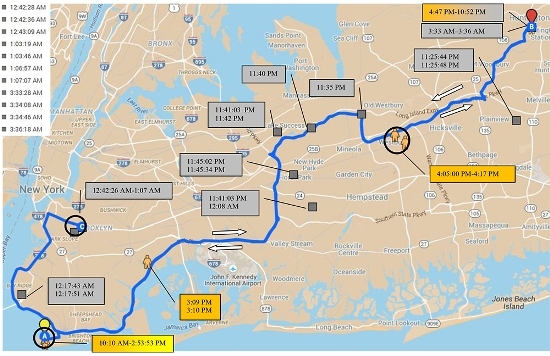 He then went home for approximately two hours, before leaving again before 10 p.m. for a near one-hour drive, most likely taking the Grand Central Parkway to the Belt Parkway to his fiancée's home, where he stayed the night. Map 2 -- Tuesday, March 4 - Wednesday, March 5: Two days at fiancée's house. On March 4 and 5, Moalawi's cell phone consistently connected with the cell site near his fiancée's apartment for all calls on both days. This implies that Moalawi was at or near his fiancée's apartment during those two days, probably not working, or perhaps working remotely. Map 3 -- Thursday, March 6: Home in the afternoon and a late night out in Prospect Heights. Moalawi was at or near his fiancée's home until about 3 p.m. on Thursday, March 7. Having spent three nights at his fiancée's place, he drove home for dinner. Then it appears that Moalawi left home sometime after 10:52 p.m. for a late night outing in Prospect Heights - possibly picking up his fiancée as he passed Sea Gate. After a late night out in Prospect Heights, he was at home by 3:30 a.m.
Map 4 -- Friday, March 7: Stony Brook University and another night out in Prospect Heights. Moalawi slept at home on the night of March 6. On Friday, March 7, he went to Stony Brook University, to the same area that he was in on Monday. After perhaps taking classes or attending meetings, he likely grabbed dinner in Syosset, and then headed out again to Prospect Heights for after-dinner socializing. It's likely that Moalawi has a close friend in Prospect Heights with whom he likes to spend time in the evenings.